With the release of Foresight's latest nanotech roadmap a clear path has finally been blazed across the mesoscopic pass. The interesting thing to me about this work is a number of recent research and industry developments which play directly into the map's strengths. Nanoink is sponsoring a symposium on dip-pen nanolithography and bottom-up assembly of desired nano structures. Radial diblock nanotube assembly, Brookhaven's DNA organization of nanomaterials and Caltech's programming of DNA self-assembly pathways are all recent sign posts. And if you want a dizzying array of optional paths, just punch the word "Supramolecular" into Google. The linked article got me thinking about the ol' "Stubby fingers" problem. 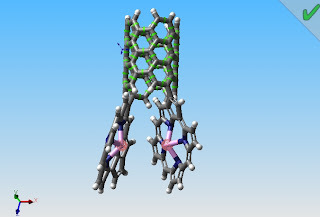 So I wrapped my head around some potential moiety grabbers and came up with this neat-o porphyrin and carbon nanotube based device. Several points: this ring is from chlorophyll so it has an Mg core atom, the linked article used Zn and of course, hemoglobin uses Fe. Which points out the range of tools that switching a single atom can produce. 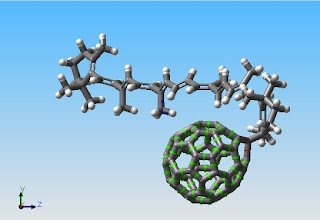 Porphyrin have the added benefit of their optical and electrical properties which I figure means they can be charged optically and quenched electrically (via metallic nanotube) so as to open or close them, respectively. This device could easily be mounted on one of the newer nanotube-tipped electron microscopes. Once more, thanks and credit for Nanorex's fine Nanoengineer-1 software. The ever salient Christine from Foresight's Nanodot has interesting things to say about discovery and understanding which highlight a thought haunting me for a while. I think one of the biggest revolutions nanotechnology has brought into existence is the subsidiary product of a different way to see the world. No longer just the bulk materialism of old. Anyone involved long enough with nanotechnology begins to see the world as its ensemble of minuscule, invisible parts. When I look at a cup of water now I see a ten-to-the-twentieth molecules H2O machine with some additional minerals and gases suspended in it. Whether the silicon dioxide gravity restraint system is half-full or half-empty I'll leave up to you. Professor Ronald Kluger and PhD candidate Svetlana Tzvetkova at University of Toronto have found a relatively simple method to incorporate unusual amino acids into peptides. 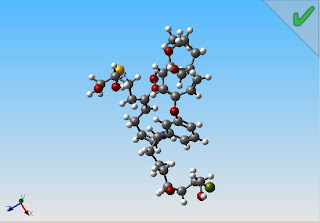 Found this neat dynamic DNA design tool off of Niles Pierce's lab at Caltech (I posted about his nucleotide programming a couple days ago) Lots of good stuff to explore at both places. This isn't high-end MNT grade stuff, but the potential positive product and profit fall-out from this looks good to me. There are a lot of vitamins, bioactive compounds, minerals, etc. which would benefit from nanoencapsulation in a digestible medium especially in regards to taste, palatability and absorption. Plus, these products will get to market without the excruciating regulatory maze that is necessary for pharma products. In a technique very similar to Paul Rothemund’s DNA origami, California Institute of Technology's biomolecular engineer Niles Pierce has developed a method for programming motion and logic in oligonucleotides. Not quite the full fledged assembler that the article would like it to be, but still an interesting advance in the technology. This is just pretty cool stuff here. It is unclear from the article whether these pipettes are actually fullerene nanotubes or not. If so, then I see in this a method for producing very long CNTs. Scanning transmission microscopes can be used to reshape single wall carbon and boron-nitride nanotubes. We've seen a number of electrical methods for welding nanotubes, this is the first I've come across that allows precise defect introduction. I've been privileged to get my digits on an Alpha release of Nanorex's Nanoengineer-1 and I must say I'm having a blast. I saw my first molecular dynamics models in about '86 and have salivated in envy ever since. I have modeled many things in my software design career: planarian worms, dividing bacteria, plasmas, nuclear magnetic pulses and a few others. I can tell you it isn't an easy or forgiving field. Been thinking a lot about assembly procedures and the top down/bottom up dichotomy. In particular the technique of molecular imprinting has my mind spinning. In a modern factory such as those which make linoleum there is a process called "roll-to-roll printing" which is a nice analogy for what I'm thinking of. Say we take some DNA origami pattern or perhaps an active peptide, enzyme etc. and bond a molecule thick layer to a metal cylinder of sufficient diameter to have thermally separate zones. Then the coated cylinder rolls through a solution of -mers which cover and fill the voids and surfaces of the molecular molds. Appropriate polymerization agents (UV, ions, infrared or chemical) could then be applied and after the polymerization completes the cylinder could rotate into a region which cools it, thus pulling away the template from the polymer substrate. In this manner a continuous surface of identical molecular behavior could be rolled out of effectively unlimited lengths. Max Planck Institute of Metals has done some good work on the Casimir sticking force. Interestingly they are able to play on aromatic surface charges to reverse the sticking force and encourage free movement. Not suitable for operation in a vacuum though, solution only. Arizona State University’s Biodesign Institute have developed one of the first practical applications of what I see as a fully integrated nanoscale device. This DNA barcode style array holds a lot of potential. I could see the height increase created in the device's cantilever being used to open valves to release therapeutic agents for instance. Japan Science and Technology Agency brings us a particularly interesting method to self assemble graphitic nanotubes from chemical precursors without going the chemical vapor deposition route. Due to this being an azide mediated approach the resulting tube may be site-selectively functionalized. Scientist from Japan's National Institute of Advanced Industrial Science and Technology have managed to fuse carbon nanotubes using a controlled electric current. I'm thinking that the method sounds simple enough to automate, maybe on a nems or mems chip. With CN's high length to width ratio it should be a simple matter to get a series if individual tubes aligned, maybe in open "trench" arrangements. Then a series of electrostatic rotors could drive the tubes into by-pass alignment prior to fusing them. An on-chip STM could check them for quality, maybe another could perform spot repairs on tube discontinuities. This would allow for unlimited tube lengths. Been reading about attoliter and zeptoliter fluidics recently and I had some thoughts on potentials for control of self assembly. These tiny volumes of fluid restrict atom counts down into the tens of thousands of atoms. This is still a lot of atoms but self assembly processes will be constrained by that count. Polymers for instance will be unable to exceed this count in their catalysation, crystallization would have to occur in an indexed fashion especially if nanocrystals or colloidal particles were included in the initial solution. Mostly what strikes my mind is that the degrees of freedom would be limited albeit still huge. Many of the basic complaints about the sloppiness of self assembly can be addressed in such circumstances. For instance if a chain was only allowed to polymerize within a carbon nanotube (thinking of UV polymerization here) the polymer resulting would not be entangled with its neighbors as is usually the case. Seth asked for some extra info on the Uk's programmable matter project and unfortunately I've lost several of the links I had to the folks doing that work, but here's an older one to the same people who got grants for that project and there's also the umbrella organization Engineering and Physical Sciences Research Council. MIT's Technology Review has a look back on 2007's nanotech development. Is it just me or do most of these items just barely deserve the label "nano" There's no mention of the Uk's "Programmable Matter" project which is the world's only openly government supported attempt at molecular nanotechnology fabrication. Nor any of the hundred of incremental progress steps being taken across the US documented in journals like ACS Nano Letters or IOP nanotechnology electronic journal. A place to ponder current and future technology, especially and mostly nanotechnology. From below you shall rule. Random ponderings of potential nanotechnologies. I try to do my best to make my speculations run parallel with observed fact and currently in use technology. Broader Perspectives. Melanie Swan is so smart and digicute. The Foresight Institute no Nano blog would be complete without it.